ATV Parts, ATV Radiator Kits, ATV Wheels Tires, ATV Suspension Springs Shocks Bumpers - Wild Boar ATV Parts > Radiator Relocation Kit > Kawasaki Brute Force 05-11 650i/750i Radiator Relocation Kit Rebel Flag Plate $189.00 FREE SHIPPING! « Kawasaki Brute Force (2012-2019) Radiator Relocation Kit w/ Screen (Silver) $189.00 FREE SHIPPING! Kawasaki Brute Force 05-11 650i/750i Radiator Relocation Kit Rebel Flag Plate $189.00 FREE SHIPPING! 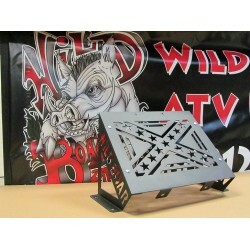 Wild Boar Radiator Relocation Stars & Bars Kit for Brute Force is Now on SALE $189.00 FREE SHIPPING! DON’T FORGET to check out our other products that can be purchased for this bike listed with link below! Audio Systems, LED Lighting, Accessories, Cleaners & Oil Change Kits, BELTS, AXLES, Lift Kits, Snorkel Kits, WINCHES, Wheel Spacers, Tires & Wheels, BIG WHEEL KITS! CALL TODAY TO ORDER 850-912-4350 or Order Online!! The Kawasaki Brute Force is a mean machine. These ATV’s are perfect for any ATV enthusiast looking to play hard in any kind of environment. Kawasaki knew what they were doing in designing these bikes. Whether you ride your Brute Force the swampy, peanut butter mud of the south or take it through the deep snow up north, you always run the chance of something clogging up your radiator and causing your bike to overheat. Here at Wild Boar we offer a solution to keep your Kawasaki running all day no matter what kind of weather you’re in. Here at Wild Boar we are happy to offer some of the best radiator relocation kits on the market. Keep your machine cool while riding in style our relocation kit for the Brute Force. These kits are all Steel construction, complete kits that include all the necessary mounting hardware you will need. Laser cut and powder coated, this will not only be the most solid, but the best looking kit you’ll see around.